ES-Divers offers a wide range of services geared specifically toward our energy andpower production clients. Our full-time diving and supervisory staff have extensive work histories in energy and power production facility environments such as hydroelectric, fossil fuel, and nuclear facilities. NRG Energy New Castle Pa.
ES-Divers was able to assemble prior to the arrival of the additional topside crew to set up and view the work area. After visual inspection of the dive location and safety brief with all parties involved (including Dive team top side support and the client representatives), ES-Divers entered the water adjacent to the locked out / tagged out intake screen. After the most prominent leaking areas where identified the diver installed individually marked and cataloged sealing provisions into these areas. Additional sealing provisions (all individually marked and cataloged) were also introduced as needed until the space behind the intake stop logs could be completely dewatered. After dewatering, ES-Divers remained in a “stand by” readiness while the topside crew completed all necessary welding repairs to the main trash rack and its guides. Once the welding work was completed, ES-Divers recovered all sealing provisions from the water and checked them off the catalog list to ensure no foreign materials where introduced to the area. The scope of work for ES-Divers was focused on the areas located at Unit #4. Work was to be completed in a safe, timely manner and fit into the plants scheduled outage. Planned tasks included cleanout of river side screen bays, cleanout of traveling screen bays, and intake valve inspections. 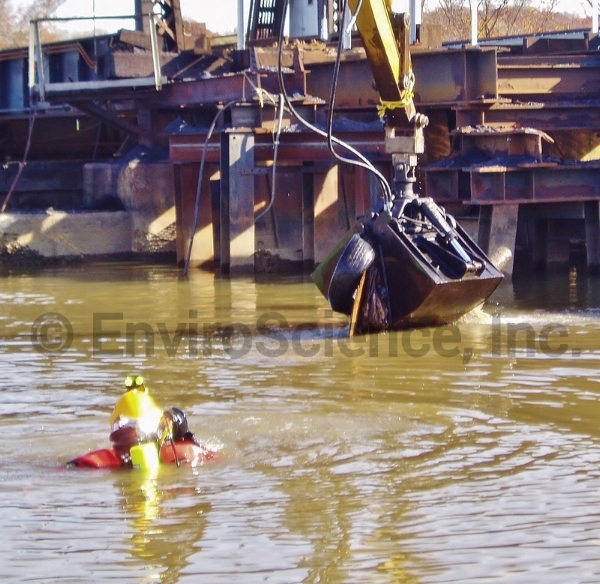 ES Diver assisting in underwater debris removal. ES-Divers prides itself on a history of safe efficient work and task management during long term jobs such as this. By drawing on these methods and keeping the lines of communication open with clients, ES-Divers was able to remove sediment and wooden debris from 3 outer bays, clear sediment from the riverward aprons surrounding these bays, clean and inspect the inner bays, as well as inspect the butterfly valves on the bay interior just past the traveling screens. ES-Divers was able to complete all their tasks in just under 7 working days, saving the client from any unexpected down time. ES-Divers was tasked with inspecting and performing any reanchoring or repairs necessary to maintain proper function and positioning of 250 feet of oil skirt boom in front of the plant intake. After the boom was reanchored and repositioned, all the section fasteners were inspected for wear and alignment and all debris was collected and taken to shore. A large tree that was approximately 50 inches in diameter and 14 feet long had become lodged near the boom. It was rigged to the ES work boat and hauled down stream to a safe location.